Home / Technology / Gionee A1 Lite Review: It's All About Taking Selfie and That's It! Gionee A1 Lite Review: It's All About Taking Selfie and That's It! The mid-range market segment is highly dominated by smartphone giants like Motorola, Xiaomi. Gionee launched it’s a series android phones and made an entry in the same segment of the industry. The new A1 Lite primarily focuses its distribution strategy across the physical stores. The year 2017 saw two big launches of Gionee A1 Lite and A1 Plus. 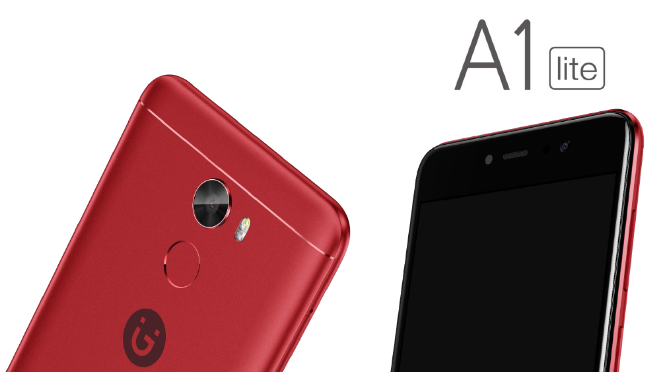 The A1 Lite is third in the line which is considered to be cheapest of the lot, priced at Rs. 14,999. Despite of having average specifications, its front camera and battery are something to look forward. Though it is a bit smaller than others in the series, the design of the phone is almost average due to its wide bezels. While all the tycoons are in a race to provide narrower bezels, A1 Lite doesn’t have that premium vive to it. ● The selfie lovers are going to love the phone because it features a front camera of 20 Megapixels and is also the USP. However, the setup of camera is almost the same as the earlier ones. The quality of the pictures captured by it is also almost average. The phone only delivers good images if the lighting is good. Also, there is a persisting issue of soft focus. However, the images don’t pop up with blemishes and instead the skin tones are a lot smoother. ● The build quality is very similar to the other phones in the same range. However, it induces quality on every front when it is held in hands. The curves and edges are very smooth and the buttons are easily press-able too. ● The display screen is 5.3-inches wide with 720 p resolution and the front camera is placed at the top bezel. The camera is coupled with a flash. The panel has volume control keys on its right side along with the power button. The size of the screen makes it a compact phone with no borders around the body. The left side of the smartphone is reserved for the dual-SIM tray. ● The bottom bezel is placed with the navigation keys which are for the usual home screen, menu and previous buttons. Apart from that, Micro USB jack and headphone jack are also on the bottom edge. ● The back panel has aluminium finish, however, both the ends have plastic caps to make the network frequency work better. The top end is meant for the rear camera of 13 Megapixels. Along with that, it has a LED flash and the fingerprint scanner is placed just below it. ● A1 Lite operates on the 4th Generation OS with the User Interface of Amigo 4.0. Hence, it works a little different than the other standard interfaces. Instead of the hierarchy structure, all the applications are placed only on the home screen. To manage all of them, there are dedicated folders which are pre-installed. Hence, it enables quick swiping across different folders to access them, instead of going back to the home screen again. For frequently used applications, there is a shortcut bar at the bottom. ● Also, unlike all other phones where you have to pull down the notification bar and access other settings and shortcuts, in A1 Lite you have to pull up the bar rom bottom. You can also do some minor tweaks from the settings in the themes available to suit as per your taste. ● Powered by Octa-Core 1.3 GHz processor gives the phone a little bit of disadvantage when compared to Snapdragon Qualcomm. The Mali T-720 GPU isn’t a much powerful chipset and the performance drops in the everyday use. It also deters the gaming performance as the frame rates start dropping even in the averagely intensive games. ● The 3 GB RAM gives a competitive edge as it makes the multi-tasking a bit easier. However, it also has some restrictions if you operate more than 15 applications as the same time. Now you can easily finance Gionee A1 Lite by breaking down the amount into easy instalments ranging from three, six, nine, twelve and twenty-four months. The EMIs are at no cost if you purchase a product by swiping your EMI Network Card on Bajaj Finserv EMI Network. Purchasing from here would also enable you to avail some discounts on purchases on the MRPs of products. You can shop from any of the partner stores across 1300 Indian cities with 60000 stores. You can avail an EMI Network Card by approaching a store and submitting your KYC along with a cancelled cheque. Moreover, if you are an existing customer of Bajaj Finserv, you can just login to our customer portal Experia and apply for an EMI Network Card. With the Bajaj Finserv EMI Network, you can avail loans up to 4 Lakhs to shop for more than a million products. Bajaj Finserv also has some customised pre-approved loan offers. These offers simplify the process of availing a loan and helps in saving your time. Apart product financing, this facility can be availed for any loan right from home loans, personal loans and any other. All you have to do is enter some basic details such as your name and mobile number and check your pre-approved offer.